As you can probably tell, I love Airstream food trailers and am fascinated to see the variety of cuisines served out of them. They are so cute! One day I would love to own one and serve my peculiar brand of cooking out of them. I make a mean veggie eggroll and have often fantasized about working the Minnesota State Fair in the summer….. My daughter Miranda is a cupcake queen who also needs an Airstream food truck some day. 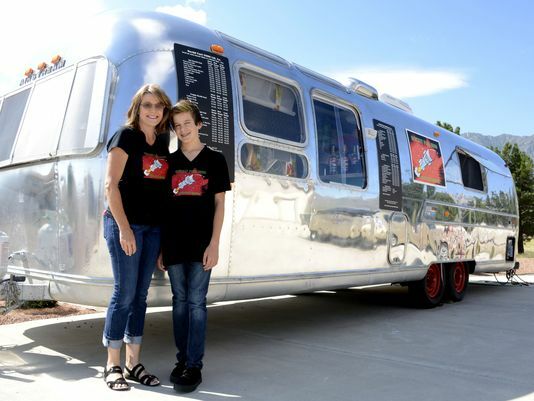 This 1971 Airstream was converted to a morning coffee and light breakfast fare rolling restaurant to serve the denizens of the White Sands Missile Range near Las Cruces, New Mexico. Can one really make a living doing this? Lovely! I live in an Airstream in Albuqueruqe, I’ll have to make it down to White Sands to check this out! Lovely! I live in an Airstream in Albuqueruqe. I’ll have to make it down to White Sands to check this out!